Editor: The stock API was deprecated so the latest stock price and dividend information is from MARCH 2018. The current workaround is manually add dividends from there forward. We are searching for an alternative API. Let us know if there is interest in a paid option here (we are also looking for a free option, contact us if you have a lead). Here is a stock return calculator which automatically calculates dividend reinvestment (DRIP). It has daily resolution and properly accounts for stock splits and special dividends. There are currently ~3,200 American stocks in our database. You can find the full list of supported tickers here. We cache results for up to one week; the tool adjusts starting and closing dates automatically when you hit ‘calculate’. Read below the tool for full instructions and notes on bug and feature requests. 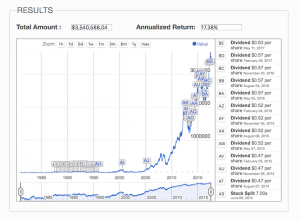 The Stock Return Calculator with Dividend Reinvestment (DRIP)! Financial Data provided by Quandl. Note: The calculator does not account for spin-offs. If your timeframe includes a spin-off, you need to do manual calculations. Calculating a stock total return with the tool. Note: the stock total return calculator isn’t clairvoyant. If you see a future date the tool rounded to the closest snap-point. Frequency: How often this dollar cost averaging or paycheck contribution went into the stock. Total Amount: The value of the investment on the ‘Ending Date’. Annualized Investment: Our estimate to the amount returned annually by the investment, including any dollar cost averaging. Dividends: We list the ex-dividend date and dividend amount for all dividends in the set. How do the Periodic Stock Investments Work? The tool makes a best effort to time dividend reinvestments based on your inputs. Dates are tricky, especially when mashed up against market holidays and weekends and leap years. In reality, you can only periodically invest if the market is open, and usually only after you receive money – perhaps a paycheck? The day counts are derived from the roughly 252 trading days a year in the stock market. In the stock reinvestment calculator, if a dividend and reinvestment occur on the same day, dividends are applied first and the investment is calculated from the discounted price. The tool uses the ex-dividend date as the payout date. There’s a reason for the common warning “past performance is no guarantee of future results”. Even if you see a previously successful investment (and perhaps, especially) you can’t count on returns to carry on in the same manner. A Graham Number Calculator which uses Benjamin Graham’s method to estimate a fair price. A Discounted Cash Flow Calculator which uses estimated future earnings or cash flow growth to estimate the fair value of a stock or investment. (This one can auto-populate many stocks in this set). There are no guarantees in stock valuation – it’s hard to predict the future. However, those tools might help point you in the right direction. This tool uses the Quandl WIKI EOD Stock Info database on the backend. Detailed information on this dataset can be found here. The calculator internally creates a datastructure which contains the initial purchase and the price fluctuations using stock closing prices on each day. (Normal) splits and dividend events cause us to increase the modeled number of shares held. Reverse splits will reduce the number of shares held. The stock total return calculated is idealized, based on closing prices, and will not match the exact returns. We are not modeling taxes, management fees, dividend payment timing, slippage, or other sources of error. It is possible that the dataset contains errors as well (let Quandl know and help improve the dataset). Outside of ads, I’m not compensated to build and maintain this tool. If you want something better or want more features, make a contracting inquiry. Results are cached for one week so as not to overwhelm our data provider. Your data can be up to 5 trading days off if someone else checked a ticker. The tool will automatically show the true closing date. It has to fetch 2 large pieces of data: the entire ticker list then a daily stock record. At launch, some daily histories date to 1970. Results may take up to a minute (or more) depending on your internet connection. This information is for informational and research purposes only. We will not respond to requests to provide investment returns in a legal capacity. We can only help you with research inquiries. You probably need a professional known as a “forensic accountant” for audited results for legal purposes. The full list of available tickers is available here – if your ticker isn’t listed it’s not a bug. Let me know if you find a bug. Let me know which ticker caused the issue and I can debug it. The tool doesn’t account for spin-offs – you’ll need to work around spin-offs manually. We originally built a version of this stock total return calculator for DQYDJ’s five year anniversary (and 749th published article). We improved the tool to have daily resolution, handle splits properly, and to move to Quandl’s WIKI EOD Stock Info database. Our motivation is to produce fair, dividend reinvested return comparisons to the idealized reinvestment tools we have elsewhere on the site. For comparison purposes, try our Dow Jones Industrial Average Calculator, S&P 500 Calculator, the Wilshire 5000 Calculator, or the 10-Year Treasury Calculator. (Please turn off inflation on those calculators to be comparable.) We also attempted a similar comparison in our Any House Return Calculator tool, which uses median home prices per MSA to estimate returns on housing. Even though we’ve been building this style of calculator for years, prices returns are the most common returns quoted by the financial press. Price is just one element of return, however. Stocks may payout dividends in dollars per share or in new shares of stock; simply quoting price returns misses a real (and significant!) portion of returns. It is especially egregious for special dividends, which can payout large cash returns overnight – while lowering a stock’s price. With this calculator, you can finally do stock total return math very simply, by only providing a few dates and some investment information. We hope you enjoy the any stock dividend reinvestment calculator. Use it in good health, and may your dividend payouts be many! Awesome! And congratulations on the five-year blogiversary! Thanks 5 tons! What am I doing with my time? AMAZING! I bet there is a way to use the tool to compare a basket of dividend paying vs non-dividend paying stocks to see if dividends really do affect future stock prices (sorry, the topic is on my mind after reading an article on SA lol). Yep – go wild, in fact. Once the data is loaded for one stock you can refresh very quickly if you’re looking at multiple time-frames. Finally there’s a way that doesn’t involve breaking out the Excel! I am trying to calculate Royal Bank of Canada stock value and number of shares from August 2001 to February 9, 2014, (the date of my father’s death), however, your screen will not accept the symbol RY, it only accepts RY.TO which is the stock traded on the Toronto Exchange, and the two are priced differently! Can you HELP??? Thank you so very much! Unfortunately not much we can do about it – and even so, RY.TO is probably ignoring the details of the split. We get our data from Quandl: https://www.quandl.com/YAHOO/TSX_RY_TO-Royal-Bank-Of-Canada-RY-TO , and the Canadian stocks that seem to work are the Canadian listed ones without splits (.TO), and any American listed ones. We might eventually try for a workaround, but for now it’s best to stick to American stocks. As for calculating it from scratch, you can import it from finance.yahoo.com since they list all dividends and splits. Stange – I just cleared the cache and they seem to work again (but Quandl only has data back to early 1998 on those two, so we’ll have to stick to the last 16 years or so). Thanks for reporting it! Okay, made further changes – seems some files were writing before all the data was retrieved. This might fix it (Tried T, KO, PG, XOM). Let me know how it looks for you. Looks like that one won’t work – for others seeing this, it’s a UK listed firm with 2 ADRs in the US, A and B. Seems to be temporary – I just cleared some caches and it worked for me. Try again when you see this. I will check into it eventually, I think Quandl changed their lookup. I will post that link in a more prominent place as well. This seems like a great tool. The numbers look reasonable. I’ll need to leave a more complete audit for the day I become a smarter guy. 2) You advise during what times I should best constrain my querying. I live in the Pacific time zone. PS: KMX did not come up any of the 3x I tried, yet it seems to be on Quandl. You’re right – KMX looks like a temporary error. Try again when you receive this comment. Before wasting money on me coming up with something custom, feel free to try your #2. If you want to minimize calls to Quandl and get the best response times, the best way would be to run it in reverse – do the 10 year, then the 5 year, then the 1 year. The tool should cache the data in between so the 5 and the 1 year query will be fast for you (and we only hit Quandl 500 times). As for website timing, anything when the market is closed should be fine, but after work Pacific is certainly a slower time for the site (and Sundays). Glad you enjoy it! The numbers will, of course, not be 100% real – consider expenses, slippage, timing, taxes and the like. It’s more of a ‘theoretical max’ from a numbers perspective… but luckily all stocks will be skewed in the same way. Keep that in mind if you compare stocks with different tax treatment – MLPs, REITs, etc. Thank you very much. I just tried KMX again here Sunday at 9:45 am PT and that ticker plus those that worked before, specifically MHK and SNA, are all resetting to the AAPL default. Browser is the current Chrome Version 39.0.2171.95. Ditto on the OS, Win7 Home Premium SP1. Thank you. Whoops – broke it debugging, (hopefully) fixed it now. To others reading: the error messages should be a bit less cryptic now – if there is an error from the data provider, it should tell you (and to say try again later). Not found – ditto. Thank you. The calculator worked very well here on a Sunday evening, quickly returning results for the first few tickers that had not worked at all for me before – KMX, HAS, IPG, and KSS. And your hypothesis about “running (each ticker) in reverse” (10 year, then 5 year, then 1 year) worked like a champ. But at LB, the 5th ticker that was next up in my list, the calculator just kept clocking without returning anything. I let it go for an hour, came back and reset the calculator, but it still just kept clocking w/o returning any result or error message. However at the 6th ticker in my list LEN, the results came back right away. BTW I’m also good with numbers that are as you point out “not 100% real (due to) expenses, slippage, timing, etc”. Since my aim is to identify the companies that approximated, beat, or trailed the S&P 500 by those 3 timelines, exactness isn’t meaningful. But having numbers that are superior to unit prices sans dividends, splits, etc. is of course very meaningful. As others much smarter than I have said, it’s better to be generally right than wrong to the 7th decimal. Hmm, for some reason Quandl’s master list doesn’t have LB (or, I assume, the active LB you are looking for – NYSE’s L Brands, Inc.): https://s3.amazonaws.com/quandl-static-content/quandl-stock-code-list.csv . I don’t have time now, but I promise to revisit how to get the most recent tickers. That CSV we download once a month and use it during the ‘lookup’ part of the calculator. I just wanted to close the loop with you on this. The calculator seems ideally suited to small ticker quantities, particularly when what happened “yesterday” is considered meaningful. As I started working with larger data sets, and since I don’t need “yesterday”, I ended up collecting the data I needed by other means. Using the calculator was very helpful for thinking through how to realize our family’s objectives. So thank you very much for your fine work! I’m glad you got some good usage out of the tool – feel free to spread the word! For what-if comparisons (including reinvestments) I’d like to include an S&P 500 index ETF. But the ones I’ve tried (eg AMEX:IVV) aren’t available and don’t work. There must be an S&P 500 ETF ticker that works? Thanks, PK. I’m aware of the calculators you list, but none of them allow reinvestments like this one does (qwk, q2wk, q4wk. qQ). Please consider supporting one of the S&P 500 index funds? It would be a very handy benchmark for comparisons. And, I don’t believe there is a good calculator available that accounts for both dividend reinvestment and periodic reinvestments (ie dollar cost averaging). I’m surprised there haven’t been a lot of requests to add an S&P 500 index fund! Keep an eye on what we’ve got coming – we can’t do anything about the ETFs, but we probably have a solution for your monthly or quarterly requests. Sorry to hear supporting a tracker of the S&P 500 is not possible (eg VIIIX, SPY or IVV, just one . . . any one!) Particularly when that’s where more and more folks are allocating their regular contributions to retirement accounts. Myself included. One of my accounts kindly provides the CAGR as a “personal rate of return”, but the other does not. Of course manual calculation in this situation (regular contributions/reinvestments) is just as much out of the question with index funds as it Is for single company stock. So I continue to hope that a way can be found to extend this calculator to an S&P 500 index fund! Really love this calculator, way better than I’ve been able to do using Visual Basic and yahoo. Two comments: How is the dividend reinvestment programmed (invested using a company’s DRIPS program, use closing price of the day the dividend is paid, dividend reinvested at the average price over the month the dividend was paid, or another way)? Second comment is the the added investment box seems to be an absolute value. Don’t know how difficult it would be but if a negative number could be entered this would be a real slick retirement back test calculator for an individual equity. It’s averaged by week by our data provider, and there are no fees factored in. As for negative numbers, it shouldn’t stop you – just look out for weird results (like withdrawals when you are already below a $0 balance). There isn’t any boundary checking for the reinvestment portion. However, you should be able to see when the balance goes negative on the graph, and mousing over it will give you the approximate date where the balance intersects. Quick question on the way spin offs are handled, especially optional spin offs. How does the calculator assume those are handled? When I input MCD over a lifespan that includes chipotle spin-off, it shows nothing in the log about it. Also seems to have issues with the COP P66 spin-off. In both these cases, the answer looks off by a HUGE number from reality. Good question – there isn’t a way to link these in the data, and I don’t currently know a good way to do this programmatically. If you have any leads on an API, let me know, it would be great to roll something in. I’m going to add a note that folks will have to manually work around spin-offs. Having recently assumed Power of Attorney for an aging parent, I’ve pretty much had to start from scratch in learning about the stock market, so I really appreciate the information you provide. I do have one question. I needed to find the dividend history for Dow Chemical in order to calculate the cost basis for tax purposes due to the Dow-DuPont merger But, when I tried to use the dates that came up here for 2001 – 2012 payments, I was really confused because the history I received from the broker showed their payments being credited to the account on different dates. And the stock prices for those dates were significantly different from those listed for several days on either side of the posting dates. To make a long story a little shorter, I finally realized that the dates listed here are the ex-dividend dates rather than the actual issurance dates. I’m curious to know if your use of the ex-dividend dates is intentional and, if so, why is that better? (I’m wondering if I should be data-entering my history differently.) Thanks for your help! I can’t comment on the suitability of the various dates in your personal calculations – but ex-dividend dates do make the math easier for this tool as the reinvestment can then be done ‘that day’. I think you’ll find that other data sources (e.g. 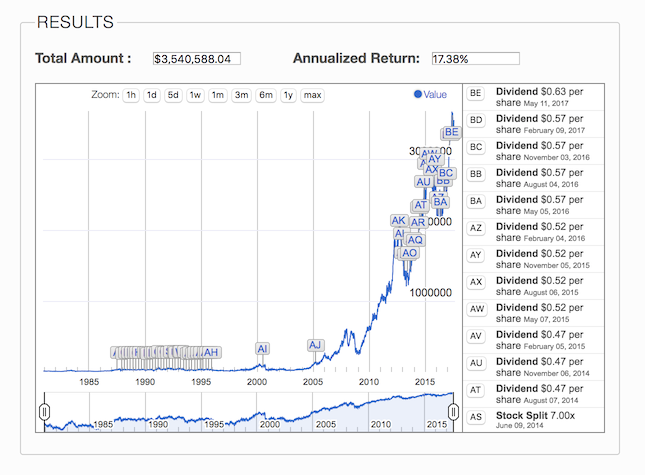 Yahoo’s dividend history: https://finance.yahoo.com/) will also show the ex-dividend dates instead of the date dividends actually hit a person’s account. Maybe we should do a post on the ex-dividend date, but in short – any prices you saw quoted before the ex-dividend date were still prices when trading with the dividend amount incorporated in the stock price. A tool like this should get you “in the ballpark” of the exact return, but there are many variables that would push it off target. Dividend reception, fees, slippage, and taxes are all factors that would cause small errors in the calculations – nothing will beat the actual math you see in an investment account. I reset the cache and it looks like it works. I think it was confusing how the reinvestments were occurring in the tool; I added a new box to the calculator which gives ‘total’ invested and added a new section to the post clarifying how the algorithm works. If you use it today from 11/1/2016 – 11/10/2017 it would peg you at a total investment of $7,350.